A new evaporation dynamics study finds that very small droplets evaporate more slowly than predicted by current models. 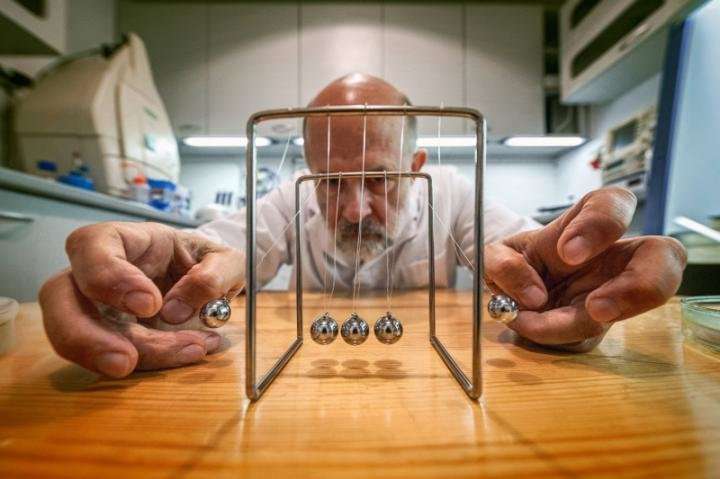 Researchers from the Institute of Physical Chemistry of the Polish Academy of Sciences (IPC PAS) in Warsaw, in cooperation with the Institute of Physics of the PAS (IP PAS),have described the course of evaporation of micrometer and nanometer-sized droplets. The result of the research, presented in the journal Soft Matter, is an equation that accurately predicts the course of evaporation for droplets of different sizes and fluids. The equation has many applications, including constructing more accurate climate models and designing more efficient internal combustion engines or cooling units. "At first glance, the slowdown of small droplet evaporation may seem to be an effect of little significance. However, every drop that evaporates into the environment has first had to decrease to the size of micrometers and then nanometers, and thus has passed through a phase of slowed-down evaporation," says Prof. Robert Holyst (IPC PAS), and notes that such dynamics shape the climate of Earth in atmospheric clouds. "If we take into consideration that the climate is a state of a certain dynamic equilibrium in the environment that is relatively easily disturbed by even seemingly minor factors, then the slowdown of the speed of evaporation of small droplets transitions from being an issue on a laboratory scale to a global phenomenon." During evaporation, a key role is played by the flow of heat between the droplet and the environment. In earlier publications, physicists from IPC PAS and IP PAS showed that evaporation starts to occur even when local temperature differences are only ten-thousandths of Kelvins. However, the transport of energy between the liquid and the environment does not always have to be related to the existence of a temperature gradient. "When a gas molecule approaches a liquid surface at a distance of several to a dozen or so mean free paths, it virtually stops colliding with other molecules in its environment. At this point, a typical description of the phenomenon by means of thermodynamics is no longer sufficient. Near the surface of the liquid, energy transport takes place in a different manner, ballistically. The gas molecule simply takes its energy and hits the surface, sometimes several times," says Dr. Marek Litniewski (IPC PAS), co-author of the research. The mean free path length of a molecule in the air (i.e. from collision with one molecule to collision with the next) is up to 70 nm. During evaporation, the ballistic transfer of energy begins to play a role for gas molecules micrometers away from the surface of the droplet, which in the scale of the phenomenon should be regarded as a relatively large value. The question arises: How much energy can be transmitted in this way, and how? Although a single gas molecule collides with a single molecule of liquid, the latter is more strongly or weakly coupled with its near and farther neighbours. As a result, the collision occurs between many bodies and its theoretical description becomes complex. "If the drop is large, its surface from the point of view of the gas molecule will be practically flat. Therefore, when such a molecule bounces off the surface, it can collide with another nearby gas molecule and hit the surface again, depositing another portion of energy into it. The situation changes when the drop decreases in size and its surface becomes more and more curved. The particle then bounces off the surface generally once, after which it flies off into space. The transfer of energy to the interior of the liquid is thus less effective. As a result, the drops evaporate more slowly the smaller they are, and the process can be slowed down at least several times," explains Prof. Holyst. Computer analyses and simulations were supported by experiments conducted in IP PAS by Dr. Daniel Jakubczyk. Under carefully controlled conditions, a number of single-drop evaporation rates were measured. The experiments were performed for drops of various sizes and for liquids including water and ethylene glycol. It turned out that the model proposed by physicists from IPC PAS in all cases accurately described the course of the phenomenon. In order to estimate how quickly a drop would evaporate, it was enough to provide only two parameters: substance mass and enthalpy of evaporation. "Evaporation takes place all around us, always and everywhere. Science has been studying it for more than 120 years, and we thought that we have a good understanding of it. However, when we look into the details of the process of evaporation, we suddenly see how much we have missed. This teaches us humility—and encourages us to conduct further research," concludes Prof. Holyst.